If everybody’s doing it, that makes it OK. Well, no. But that does make it a cultural universal—the anthropological name for something done, in some form or other, by every human culture around the world. This includes language, religion, art, marriage, war, clothing, families, gender roles, laws, taboos, personal names, etiquette, morals, etc. The cultural universal can be somewhat of a pain for evolutionists to try to explain. In a world where societies are supposed to have migrated, evolved, changed, developed and faced various extinctions separately, how can it be that every culture does these things—many of them abstract and complex? One particular cultural universal is music. It is found across all cultures—not just singing, but also the use of physical instruments, along with definite musical structure (such as our “innate” sense of harmony). Animals, to varying degrees, have a repertoire of noises in various pitches—cue the different varieties of songbirds, whales, wolves, etc. Like language, though, the animal ability is a closed system. None comes remotely close to the open-ended musical abilities of human beings—from singing virtually anything conceivable to crafting the most complex of instruments to penning Beethoven’s Symphony No. 9. Have you ever wondered where our musical ability came from? How did we begin to create music and musical instruments? How do the anthropologists explain it, according to the theory of evolution, and what does the Bible say? Does archaeology give us any leads as to the earliest development of music? This is the fourth in a series of articles on cultural universals—examining and comparing the secular and biblical accounts of our most human characteristics. The evolutionary path of music necessitates a gradual development from savage simplicity to modern complexity. Charles Darwin speculated that man’s innate musicality arose from the primeval desire to mate. Early males would attempt some form of “singing” in order to attract a mate and challenge rivals. Another theory is that human music evolved from animal-like territorial signals, which resulted in certain sounds being adopted by a territorial group, as a sort-of collective “anthem.” It is also speculated that when humans switched from all fours to bipedalism, this influenced our perception of predictable beats, and gave us a sense of rhythm. A threatening display of chest-beating—is this the origin of music? Another theory is that human music evolved simultaneously with language, defined by the term “musilanguage”—that neither of these traits are exclusive, but are mutually related, and that while music conveys the emotion, language conveys the referential meaning. Still other ideas include the hypothesis that music was developed for the purpose of “predator control–intimidating display”—a threatening combination of chanting and drumming with hands or feet. This would also induce a “trancelike” state that would make early hominids better fighters and more impervious to pain. Other, softer humming sounds would be used to indicate safety to fellow members of the group (silence itself being a sign of danger). It is impossible to put dates on any of these hypotheses. If we are to follow the “musilanguage” theory, then based on language evolution’s “Continuity Theory,” a general musical sense would have developed with language around 2.5 million years ago, reaching some kind of complexity at least 100,000 years ago. If we follow the bipedalism theory, we must ascribe rhythmic development to the transition time from four “legs” to two—a development that is put anywhere between 2 million to 7 million years ago, depending on how you classify it (i.e. walking on two legs some of the time verses all the time). Reading between the lines above, you may have picked up that the evolutionary assessment is a spaghetti of hypotheses: completely speculative, completely undateable, and reaches no conclusions whatsoever. The Bible is very dogmatic about the origins of music among the human race. It is defined not as a merely overdeveloped animalistic trait, but as an eternally existent, complex trait of God Himself—a trait that He gave first to angels and secondarily to man. God Himself sings (e.g. Zephaniah 3:17). Job 38:7 describes the angels singing for joy when the Earth was created. Other scriptures describe mighty angelic choirs and heavenly musical instruments, including the harp. As God imbued musical ability in the created angels, He also did the same for man—intending the carefully crafted use of voice and instruments for His worship. As God imbued musical ability in the created angels, He also did the same for man—intending the carefully crafted use of voice and instruments for His worship (Leviticus 23:23-24; Psalm 100:2). The sounds of music could be heard in the Garden of Eden (Isaiah 51:3). To a far lesser extent, God imbued the animal kingdom with a degree of musicality within a very finite, closed system of expression. Evolution, with endless questions; the Bible, with dogmatic affirmations. What does archaeology have to say? Obviously, there is no way archaeology can determine the first use of our earliest human instrument—the voice. But it can shed light on the first use of handheld instruments. The earliest instrument is believed to be the Divje Babe flute—a bear bone with holes drilled into it, dated somewhere between 43,000 and 67,000 years old. There is much debate about this instrument though, as to whether or not the holes were created by a carnivorous animal, as well as questions about the accuracy of the dating (the vast error margin—over 20,000 years—speaks for itself). 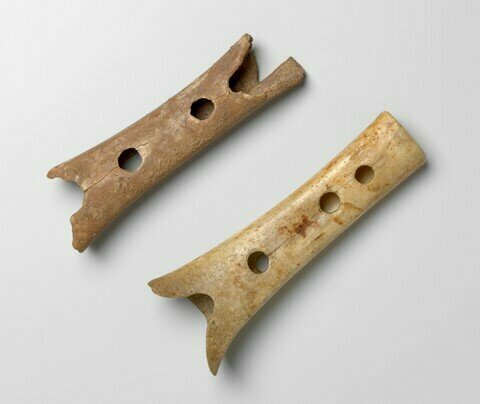 Other bone flutes (made of mammoth and swan bones) have been dated c. 35,000 years old. I take issue with these dates given, along with many others in the scientific community. This article doesn’t have the space for a full explanation. But I fully believe these given dates to be far older than they should be. Put simply: Dating methods for objects such as these, like carbon dating, are unreliable. That’s because these dating methods are used under the assumption that the Earth is, and always has been, operating under a “fixed system.” That the rate of radioactive decay in a given item is, and has always been, the same—thus precisely measurable able to give us “precise” dates as far back as millennia ago. Actually, scientific research has been proving this assumption as not just slightly, but utterly, wrong for many years now. Regular-occurring solar flares, as well as fluctuations in the Earth’s magnetic field, have been shown to directly and significantly affect rates of decay. Even simple changes in the seasons have been shown to change decay rates. And the testing of nuclear weapons over the past 80 years has been found to cause serious issue with properly reading radiocarbon dates due to even minuscule amounts of radiation particles spreading all over the Earth’s atmosphere. Generally, these issues raised have had no significant response from the broader scientific community, with regard to dating methods. Isotopic dating is the much-cherished baby of evolutionary scientists. Certain measures have been undertaken to correct the error, from revamping dates found to originally be 10,000+ years off to throwing out some dates entirely. Certainly, radiocarbon dates within the past few thousand years can be standardized and adjusted to already-known dates based on extant chronological records. However, the accuracy of dates given earlier than the past few thousand well-documented years is anyone’s guess. There is no real way to calibrate the dates with known events. As such (particularly for this very early, unrecorded human history), radioisotope dating is often way off, generally tending to give far older-than-accurate dates. Even more so, for events before human history. Such as this example of a Himalayan geological event given a date 1,900 percent greater than that found by later research. And for those who believe Earth hasn’t been a stable, fixed system for millions of years—which science shows that it hasn’t—i.e., those who believe in a Great Flood that occurred c. 4,500 years ago—then any dates given earlier to this can be considered as significantly exaggerated and entirely untrustworthy. If you’d like to research more on this subject, take a look at these articles here, here, here and here. 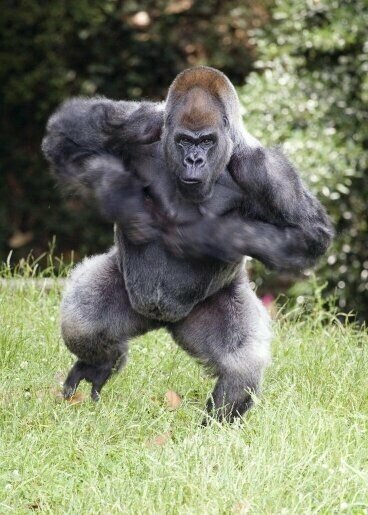 Needless to say, if, according to the evolutionary theory, mankind has been developing “musically” from the early days of bipedalism (i.e. 4 million years ago, plus or minus 2 million years), or if we developed musicality in simultaneous conjunction with language (beginning around 2.5 million years ago), then it strikes as somewhat odd that the earliest instruments are dated as late as 50,000 years old. The case that even these dates are greatly exaggerated notwithstanding. Besides ancient flutes (which could be either in the form of a single pipe or double pipe, played through the mouth or nose), one of the primary early non-percussion instruments was the lyre, or harp. The earliest evidence of the harp comes from Sumer, dating to around 5,500 years ago. 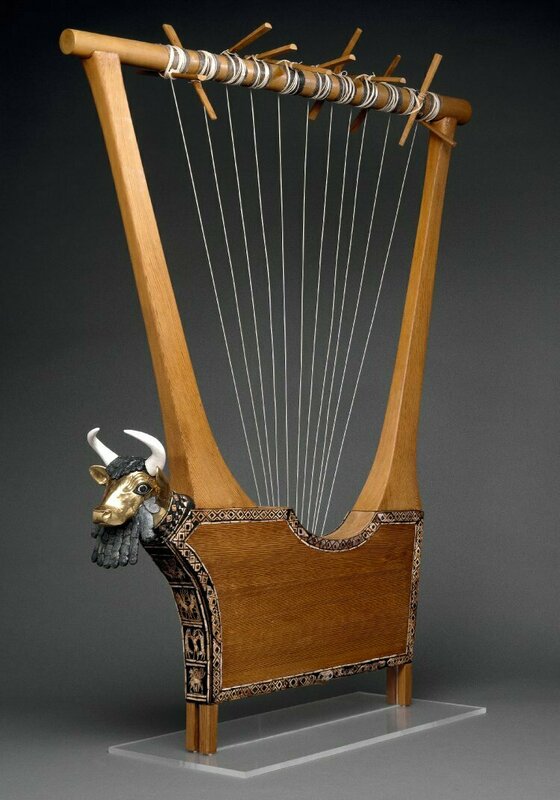 Perhaps the most famous of these early harp-like instruments are the Lyres of Ur. 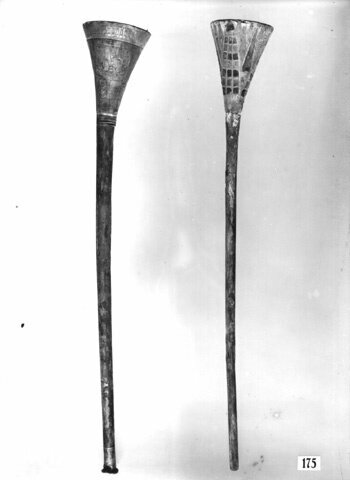 These complete, ornate lyres (three lyres and one harp, technically) are dated around 4,500 years old and were found within the Royal Cemetery of Ur (the city where Abraham is described as being raised—within ancient Sumer, or Shinar). The lyre, or harp, is an interesting instrument, historically speaking. Archaeologically, it appears rather suddenly on the scene as an already highly complex musical instrument with numerous strings. The Bible has an answer for this—it implies that the harp was already present at, or even before, the creation of man. God’s throne room is described as containing harps. Isaiah 51:3 indicates the presence of this instrument, or a similar one, in the Garden of Eden (the term “melody” is from a root Hebrew word meaning “to pluck”). 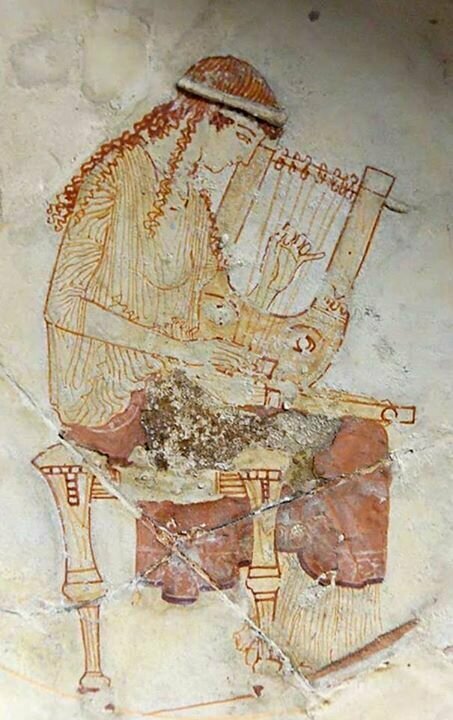 The very early nature of pipes and lyres in human musical history is interesting when compared with the biblical record. The first two musical instruments described chronologically in the Bible are the lyre and the pipe. Genesis 4:21 makes reference to these two instruments as being on the scene (according to biblical chronology) around 5,500 years ago—matching up well with the date for the earliest-discovered lyre and not far off from the given dates for the earliest complete pipes. Not only are the instruments described in Genesis 4:21—the lyre and the pipe—notable, but also the individual associated with them. One key family is mentioned in the early biblical record, descended from Cain, which brought about rapid development in various fields to the early antediluvian world—albeit for the wrong reasons. Lamech, the great-great-great-grandson of Cain, was father to daughter Naamah and sons Tubalcain, Jabal and Jubal (Genesis 4:19-24). The various professions of all are explained in the Bible (except for Naamah—though according to Jewish tradition, she was a weaver of cloth). Tubalcain was a pioneer in blacksmithing, or metalwork, specifically in producing weapons for war. Jabal was a pioneering nomad and leader in the worship of cattle. And Jubal was a pioneer in music—the “father of all such as handle the lyre and the organ [pipe].” It is apparent that these instruments were already known and in use before this point (over 5,500 years ago), and that Jubal used them for evil means. The word “handle” is most often used in a negative context, and could mean to “pervert”—it is suggested that Jubal’s music was used for idol worship. We can gain some further clues about this family, and their professions, by comparing them to a legendary family in Greek history. Perhaps there could be some historicity with these competitions, in relation to the biblical Jubal—a sort-of musical life-and-death “gladiator” sport. To the ancient Greeks, a goddess named Gaia (meaning “Earth” or “life”) was considered the mother of all living. Gaia, of course, immediately comes across as an Eve type. Eve’s name in Hebrew is Chavah, parallel to the Hebrew name Chaia, symbolizing “life,” and pronounced very similarly to Gaia. Gaia’s child Cronus, whom she bore with the first “father” god, was the patron of the harvest and is symbolized by the sickle and grain. Interestingly, Adam and Eve’s son Cain was likewise known as a “tiller of the ground”—a crop farmer (Genesis 4:2-3). A kind of musical perversion comes across in the stories of Apollo. 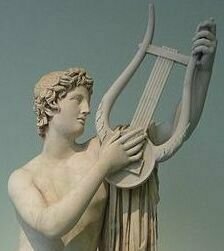 The Greek god would take part in performance competitions against other musicians. Those who lost suffered terribly. One particular loser was flayed alive by Apollo, his skin nailed to a tree. Perhaps there could be some historicity with these competitions in relation to the biblical Jubal—a sort-of musical life-and-death “gladiator” sport. The Bible’s next significant chronological mention of music can be found in Genesis 31:27—Laban complains to the patriarch Jacob that he left with his wives (Laban’s daughters) too hastily, before a celebration could be made “with mirth and songs, with tambourine and lyre.” This event dates roughly to around 1850 b.c.e. According to archaeology, the earliest-discovered evidence of tambourines is in the form of statue depictions that date just before this time, around 2000 b.c.e. (from Sumer). Laban’s statement further suggests the existence of known and notated songs that could be sung or played. The earliest-discovered example of musical notation dates to around 2000 b.c.e., in the form of cuneiform tablet fragments from Nippur (Iraq). One of the tablets indicates specific names for each of the strings on the lyre. These cuneiform discoveries are a thorn in the side of the evolutionary theory, which states that music must have developed from an incredibly primitive system of notes—perhaps leading to a simple five-tone pentatonic scale, before arriving at our “modern” seven-tone heptatonic scale. Actually, Babylonian cuneiform has shown their music to be quite complex. Archaeomusicologist Suzanne Haik-Vantoura describes the preserved Babylonian musical scale as bearing “total similarity … to our own C-major scale … based upon diatonic modes of seven degrees.” This sudden appearance of a seven-degree scale flies in the face of evolutionary development. The Bible, though, implies that mankind could have been given the seven-tone scale at creation—God not only giving mankind the ability for musicality but also the tools and the system to use it. More on the seven-tone scale further down. 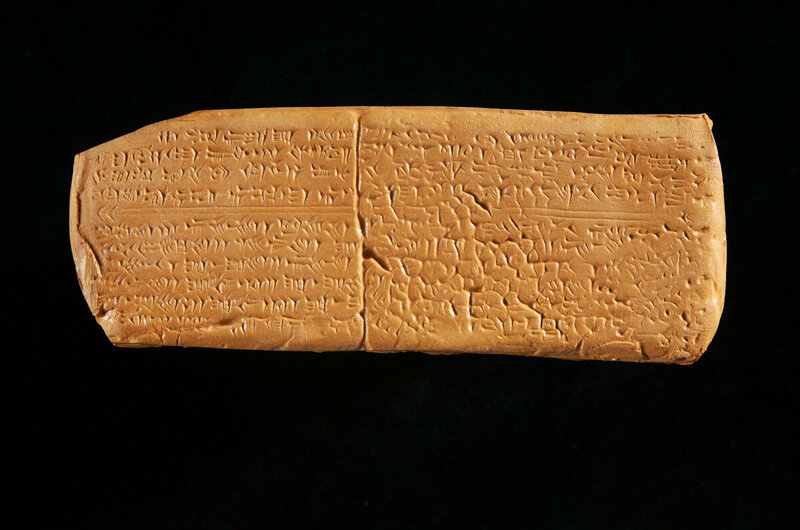 The oldest-known complete piece of notated music is approximately 3,400 years old, a cuneiform Hurrian tablet discovered in the royal palace at Ugarit (modern-day Syria). The song is a hymn, dedicated to Nikkal, wife of the moon-god; it would have been played on a lyre. Due to the complete nature of this musical piece, it has been possible to reproduce the song on a modern lyre—there are a small number of versions of the piece (of course, we cannot be entirely sure how it was played 3,400 years ago). The dating for this full-notated piece of music also coincides with the dating of the first full biblical piece of music described (chronologically) in the Bible—the “Song of Moses.” This song, found in Exodus 15, would have been performed around 3,450 years ago. As a song of rejoicing, it was performed just after the Israelites passed through the Red Sea, and must have been written down in some manner—perhaps, in its original form, fully notated—in order to preserve this account in the biblical record. 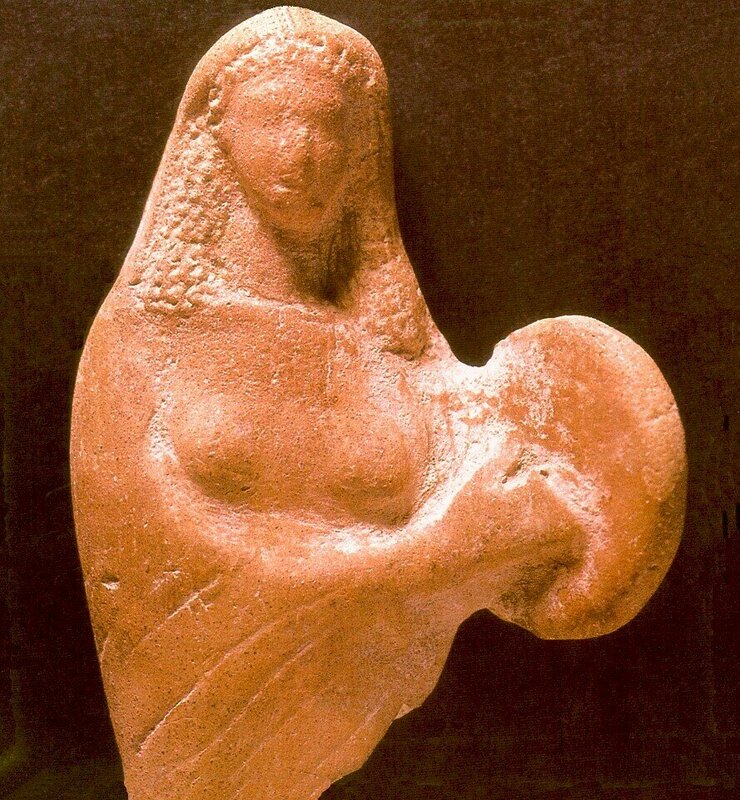 Woman with tambourine, Cyprus, sixth century B.C.E. One notable aspect of the “Song of Moses” is that it was accompanied specifically by women playing tambourines (verse 20). In ancient art, including that dating to around this time period, women are often depicted as playing tambourines. This seems to have been an instrument generally associated with women in ancient times. Thus, the archaeological picture matches up with this biblical description of the instrument being used by Israelite women. Further, the tambourine is known for especially widespread use in ancient Egypt. The Israelites, before fleeing Egypt, had “spoiled” the Egyptians (Exodus 12:36). Evidently, they must have come into possession of these common instruments before fleeing Egypt—hence why this instrument was readily available for them to use, directly after passing through the Red Sea. Not long after this event, God revealed to Moses laws about holy days, sacrifices, instructions for a tabernacle, and also various musical instruments that should be used in worship and for general use among the congregation of Israel. One specific type of instrument was the chatsotserah—a long, silver trumpet that would be used for various announcements (such as the calling of assemblies, a sound for the congregation to march, an alarm of war, and various special occasions such as the Day of Trumpets—Leviticus 23:23-25—see Numbers 10 for a long list of this trumpet’s uses). A very similar style silver trumpet, dating to just after this time period, was found within the tomb of Pharaoh Tutankhamen. Together with another trumpet that was found within his tomb, these represent the oldest playable trumpets in the world (around 3,300 years old). Israel’s “golden age” of music is said to have come during the time of King David and the Prophet Samuel. David, who himself was a skilled harpist, upheld and instituted various musical traditions, in particular surrounding religious ceremony. Music historian Abraham Schwadron stated that “probably the most important musical contribution of the ancient Hebrews was the elevation of the status of liturgical music in union with ritual ceremonies.” Indeed, other cultures had some musical tradition—but the Hebrews brought it to new heights. David formed choirs of hundreds of individuals. And of course, there is the entire book of Psalms—a collection of songs, most of them attributed to David. There is also the “greatest of all love songs”—the Song of Solomon, more properly known as the Song of Songs. The Bible does not provide a technical history of music, but the technical terms that can be gleaned from it point to the high level of musical understanding and ability of the Israelites (perhaps this is reflected in a desirability of taking Hebrew musicians as tribute—i.e. Sennacherib’s Prism, column 3, referencing Hezekiah’s tribute in 2 Kings 18). Certain Hebrew musical words in the Bible remain unknown and untranslatable due to their original meaning being lost. However, researchers have been able to at least get clues as to the musical prowess of the Hebrews. The Bible references the use of a melodic line (e.g. Psalm 98:5; Amos 5:23). The Hebrew word sheminith, used three times in the Bible, is believed to refer to octaves. This word also signifies the number 8—thus inferring that the Hebrews used a seven-tone scale, just as we do today, with an eighth-note octave. Again, could this have been a complex scale given directly to early mankind by God Himself? It is also apparent—due to the number of instruments used in performance, as well as the blend of male and female voices—that the Hebrews had complex harmonies. Anciently, the books of the Old Testament (not just the Psalms) were sung. While we no longer have the music for these scriptures, it is believed that cantillation marks, preserved in the ancient Masoretic biblical text, represent a melodic line. Various attempts have been made to reproduce the “sounds of the scriptures”—notably by archaeomusicologist Haik-Vantoura. The musical backdrop of the Bible has been continually supported by archaeological discovery. However, music has actually been used as a specific means of attempting to disprove the Bible. This is with regard to the book of Daniel (written, according to traditional dating, during the sixth century b.c.e.). One of the most vividly prophetic books in the Bible, it prophesies the rise and fall of the Babylonian Empire, Medo-Persian Empire, Greek Empire and Roman Empire. Scholars have tried to date the book of Daniel as late as possible in order to get around the vivid prophecies. Currently, the theory is that it was written during the second century b.c.e. (it can’t be dated any later, as several passages of Daniel have been found dating to this period among the Dead Sea Scrolls). Beyond their simple disbelief in prophecy, scholars attempt to provide evidence for this late date by pointing to the fact the Daniel used Greek words in writing his book—something that would be expected in the later, Hellenized time period. Music is mathematical, governed by precise calculations, and thus a fundamental law of the universe. Actually, the book of Daniel has only three Greek words in its entirety. These words are contained in just one verse (Daniel 3:5)—and they all refer to certain musical instruments. But they do not provide any proof for the book having been written at a later date than the late-sixth century. One of these words, kitharos, has been found in use as early as the eighth century b.c.e. Symphonia has been found in use during the sixth century b.c.e. The final word Daniel used, psanterin (believed to be a transliteration of the Greek psalterion), has not yet been found in early sources, but considering we currently have less than 10 percent of known classical Greek writings, one Greek word cannot be held up as evidence for sending Daniel to the second century b.c.e. It would not be impossible, nor unusual, for a few Greek technical terms denoting specialty instruments to have been used in the sixth-century royal Babylonian courts. Nor for certain Greek terms to perhaps have been adopted from earlier Aramaic or Hebrew names. Image of muse with kithara, on Eritrean cup, c. 465 B.C.E. No attempts to disprove God, the Bible or creation in general through music have thus far proved even remotely successful. In fact, the opposite is true. Attempts to attribute human musicality to evolutionary chance is one thing. But how to explain the musicality of the heavens? 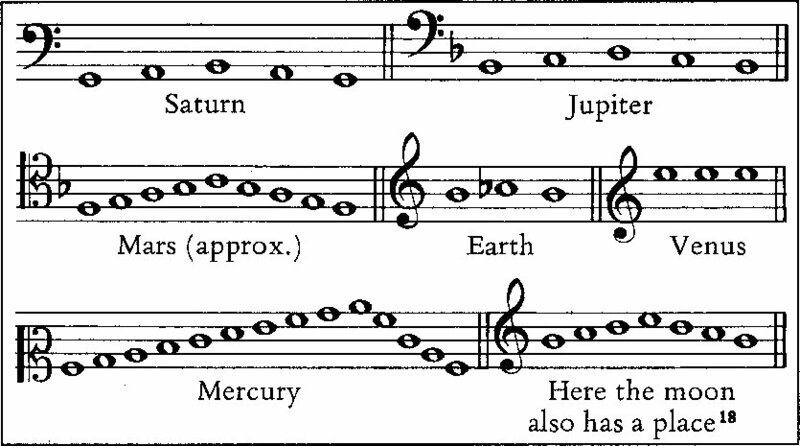 Enter the “Harmony of the Spheres”—a concept that explains, in part, our solar system as a gigantic mathematical musical instrument, with different planets and moons producing different sounds across a deliberate spectrum. How did this evolve? The heavens declare the glory of God; and the firmament sheweth his handywork … [t]here is no speech nor language, where their voice is not heard. Their line is gone out … [i]n them hath he set a tabernacle for the sun. While the spiritual realm is anathema to many evolutionists—everything must be explained in terms of the physical realm—there is something profoundly spiritual about music. The phrase “their line is gone out” can mean a musical string. Indeed, when the New Testament quotes this verse, it uses a Greek word meaning “musical sound” (Romans 10:18). Recent research has posited that the universe is out of tune (e.g. “Is the Universe Out of Tune?”,Scientific American, August 2005). This meshes with another nearby passage that describes the universe as damaged, decayed and “groaning” (Romans 8:21-22; this was caused by the angelic rebellion mentioned in passages such as Isaiah 14:12-16 and Ezekiel 28:11-19). More information on the “Harmony of the Spheres” can be found in our article here. Beyond the impossibility of this having accidentally evolved—to say that music evolved is to say that mathematics evolved. Music is mathematical, governed by precise calculations, and thus a fundamental law of the universe. How did that come about? 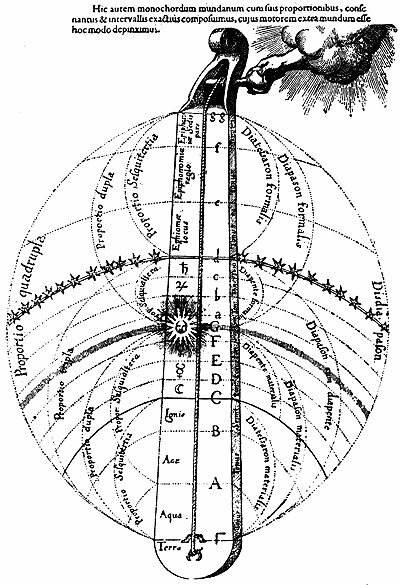 Musical laws—truly universal laws—such as the fact that every single note that has ever been sounded, by any vibrating string or column of air, has a vibrating frequency as a major triad—i.e., that the single sounded note produces a concurrent resonant harmony of other notes (less audible), known as a “triad.” That is a universal law built in to music—the triad is not just some “cultural” harmony or phenomenon of Western music. Where did such musical order, such precise mathematical harmony, come from? The idea that somehow we went from a blob of slime stewing in a boiling hot ocean to Beethoven’s 9th Symphony, premiered in Vienna’s prestigious Kaiserliches und Königliches Hoftheater, replete with violins, flutes, bassoons, etc is so outlandish it is laughable (although it seems applying 4 billion years to something makes just about anything believable). While the spiritual realm is anathema to many evolutionists—everything must be explained in terms of the physical realm—there is something profoundly spiritual about music. Something inexplicable, that transcends the physical realm. Certainly, it directly influences emotions and attitudes. But the Bible also affirms the direct connection music has with the spirit world. Through uplifting music, the demon tormenting King Saul was driven away (1 Samuel 16:14-23). Through pleasant music, the will of God was revealed to the Prophet Elisha (2 Kings 3:15). And just as there is a right use of music that uplifts the spirit, the opposite is also true. Wrongful, perverse music can bring about a demonic state of mind. Lucifer, who was created with the best inherent musical ability (Ezekiel 28), is now Satan the devil, the father of all that is depraved in the musical world. There really is truth behind the common musician’s phrase, to “sell your soul to the devil.” The likes of genres such as death metal, acid rock and rap are examples that come immediately to mind; although there are certainly other, far more subtle examples (be it in lyrics, rhythm, etc). Not only is there a lot of validated musical history to be found in the Bible, there is also a lot of ancient biblical wisdom as to the kind of music that should be listened to. King Solomon wrote nearly 3,000 years ago that it is “better to hear the rebuke of the wise, than for a man to hear the song of fools” (Ecclesiastes 7:5). The last half of that verse pretty well sums up the vast majority of modern music out there. Our article “The Song of Fools” has more information on this subject. The Bible has the only sound answer for the origins of music. Everything else has been shown to be wild, freewheeling speculation. The extant material evidence has helped confirm the biblical record, not disprove it. Even the wider physical realm around us—the solar system and greater universe—literally sings in affirmation of deliberate creation, rather than accidental collision. For more information on the veracity of the Bible, and to prove it for yourself, read our free booklet The Proof of the Bible. Also check out our booklet Does God Exist?